Your style is your personal signature in life: creative, colorful, passionate. You are one of a kind, in unexpected ways! A strong sense of self compliments your compassion for others and your desire to tread lightly on this beautiful planet, all the while fearlessly offering the world your authentic self. Whether it’s a statement necklace that demands all eyes on you, a particular piece that links you to a profound moment in your past or a hope for your future, juiceglass jewelry offers those with unique style a chance to shine. That’s you! My story starts with glass. Glass was something that I resonated with long before I was old enough to own work with it as a medium. At age seven my parents took me to the Corning Glass Museum and I was completely smitten – in awe of the adult wizards that turned something that looked like slow-flowing water into sculptured poodles and fish….and jewelry. It was a trip that changed the course of my adult life in a way only one other thing did: the birth of my son. When I became a mother I left the office world. Finding ways to still connect deeply with myself, others and the greater world outside motherhood was something I held as paramount in my new role. 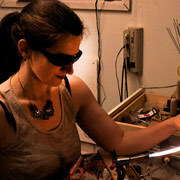 Taking my long-standing love of jewelry and glass, and with the help of an education in more traditional metalsmithing and stonesetting techniques, I created juiceglass in 2003. My devotion to creating enduring jewelry includes using unique materials to create hand-forged, often one-of-a-kind pieces. In the production-heavy, disposable world of today, handcrafted originality is key to the experience of a juiceglass piece. Striving to always be learning, and to seek the spark of connection and community with others have helped make juiceglass the into the jewelry, and myself into designer, artist, and woman, we are today. Sharing the joy of a jewelry creation and seeing someone else light up when they look into my small, wearable art is one of the best gifts of my craft. It sparks a connection with endless possibilities. 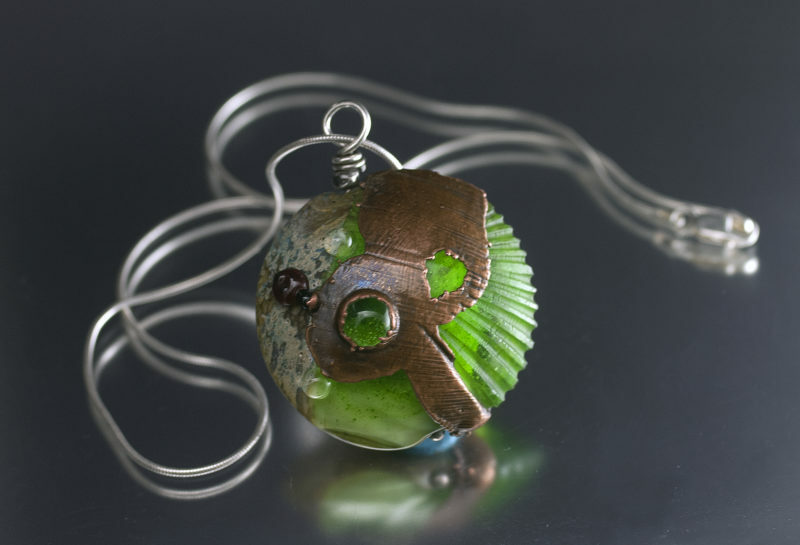 juiceglass jewelry uses glass created here in the Pacific Northwest. Sterling silver is recycled, not direct mined. Your colors, your authenticity. I work with you to create your vision of adornment. Shop with confidence, new pieces available monthly.